The very same day that the team was announced, some elements of media were already developing a very different (if sadly predictable) narrative. 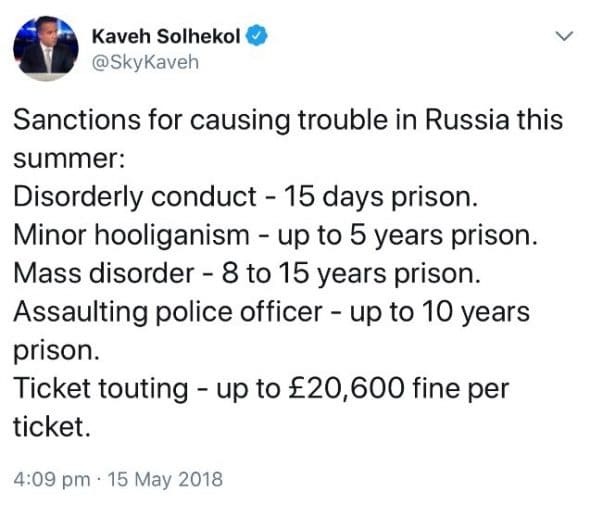 Sky’s Kaveh Solhekol tweeted apparent “sanctions for causing trouble in Russia this summer”, which was picked up by numerous football fans’ pages across social media. Last month, ITV’s Tonight programme ran a special episode with interviews from both British police and Russian hooligans, warning travelling England fans against wearing their colours or singing their songs. It’s apparent that disorder in Russia is not just feared, but expected. Those fans who are lucky enough to be travelling to the World Cup should be wary. However, it would be a huge shame to allow this to overshadow the tournament. The World Cup is the highlight of many people’s summer and to travel to one can be the trip of a lifetime for many fans. In the event that there is trouble in Russia, those who do travel should be mindful of the fallout from events in Marseille at EURO 2016. Many who found themselves caught up in the disorder were photographed or filmed by the police, later identified, and upon their return to England served with Football Banning Order applications. You do not need to be arrested, charged or convicted of any offence for the police to do this, and it is immaterial if it happened here or another country. See the factsheet below for more information. For the approximate 2,000 fans in England and Wales who are already subject to a Football Banning Order, the control period when they must surrender their passports begins on 4 June 2018. It then runs until the conclusion of the tournament on 15 July. Every Football Banning Order must include the requirement to surrender passports when England play abroad. While this may be justifiable in the most serious cases, preventing hardened hooligans from causing trouble abroad, one must remember that many ordinary fans are finding themselves on the receiving end of these applications. Even when the infractions are apparently minor, the authorities will apply for a Football Banning Order. Is this proportionate? Take for example the man convicted of throwing a boiled sweet at opposition fans. In his case, the prosecution applied for a Banning Order. While what he did was undoubtedly silly, should he really face surrendering his passport for six weeks every other summer? Will that really prevent future disorder? Is that really the kind of offending that Parliament had in mind when passing this legislation? It cannot be understated that these orders are serious restrictions on people’s liberties. Aside from surrendering passports, they can (and often do) include requirements to not go within a mile of a football stadium when a match is being played and reporting to a local police station on matchdays. They last for a minimum of three years and can remain in place for up to ten. It is clear that the law needs review. The threshold for when a Football Banning Order can be imposed should be raised substantially. However, until that time we must deal with what is in front of us. Football Banning Orders are a type of court order, usually made after a conviction for a ‘football related’ offence. They can last between three and ten years and will include one or more conditions which you must obey. Breach of a Football Banning Order is a criminal offence punishable by up to six months in prison. What could the terms be/what could I have to do? Preventing you from going to a specific place or area for a period beginning two hours before a match starts until two hours after it finishes. In some cases this can include public transport or entire towns. Surrendering your passport before international football matches. Reporting at a local police station. Exactly what conditions are made may vary depending on the facts of each case, however many courts have ‘boilerplate’ Banning Orders- i.e. a pre-set list of ‘standard’ conditions which appear on most orders that they make. How could I end up with one? The police can also apply for a Football Banning Order if an officer believes that you have (at any time) caused or contributed to any violence or disorder in the United Kingdom or elsewhere. These applications are usually based on police intelligence reports from football games. Many fans returning from EURO 2016 found themselves facing these applications despite not being charged or convicted in connection with any alleged behaviour in France. If the court is satisfied that there are reasonable grounds to believe it would help to prevent future football-related violence or disorder, they will make a Football Banning Order. Yes. You are entitled to oppose an application for a Football Banning Order. You or your representative will have an opportunity to put forward representations as to why it is not necessary in your case. I already have a Football Banning Order. Can I apply to have it removed early? Yes. You can apply to the court after two thirds of the order length has been completed (e.g. after two years of three year order). The court will consider your character, your conduct since the order was made, the nature of the offence or conduct which led to it and any other circumstances which appear to be relevant. If you qualify financially, yes. If you do not qualify for legal aid, ask about fixed fees – you will know in advance exactly how much you will need to pay for a legal assistance.